Planting seeds and bulbs provide the perfect opportunity to practice patience and delayed gratification. Pay attention to the soil and growing conditions, time it right, and you will be rewarded with your own grown-from-scratch plant and seasonal color! Spring-Planted Bulbs include tender bulbs like dahlias that are planted in spring and flower in summer. Fall-Planted Bulbs include tulips and daffodils; they’re planted in fall and bloom in spring. Planting bulbs allow you to design a garden within a garden. Interplant among perennials or shrubs, ring around a tree, plant single species in large drifts, or tuck a few in your window box for a surprise in the spring. Bulbs are a low maintenance way to have fun with color and design. Remember, garlic is a bulb crop, too! We also carry onion sets, shallots and potatoes. Create a ‘bulb lasagna’ in a pot by layering bulbs with varying bloom times for long lasting show of color. 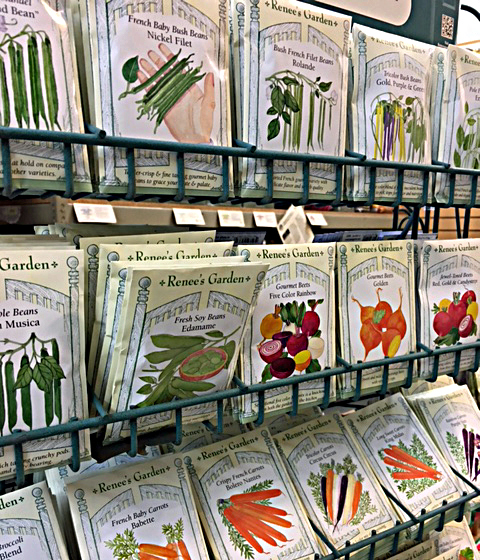 Bellevue Nursery always has at least two full seed racks year round. We currently offer Ed Hume, Burpee and Renee’s Garden seeds to provide our customers with a wide variety of edibles and ornaments, some classics and some novelties. Why should I plant seeds? Please see our Starting Seeds Indoors tip sheet. For our lawn lovers, you can find grass seed blends formulated for sun or shade. Whether it be starting a new lawn, rejuvenating or patching an existing one, we have the right seed for you. For more seedy business, we also offer Cover Crop seed in the fall. Please read more about Cover Crops from our Plant Tip Sheet Page.